There were some truly great kits submitted this week, giving the 42 voters some tough decisions. Liverpool are a club with great history, and this week will also go down in history, with 42 votes cast being the highest amount cast in any Kit of the Week poll (as far as I know). So, let’s crack on with the results. In first place, comes Tallery (me). His (my) stylish kits, that could easily be something Adidas would create for the club, took an instant appeal to the voters, collecting 19 votes out of the 42 cast, picking up a percentage of 45.2%. Second place goes to KOTW newcomer and experienced kit maker Retrogott, who produced some wonderful kits that collected 8 votes, and a percentage of 19%. J_Skinna_39 collects 3rd place for the third consecutive time, and picks up a total of 6 votes – 14.3% of the votes made. 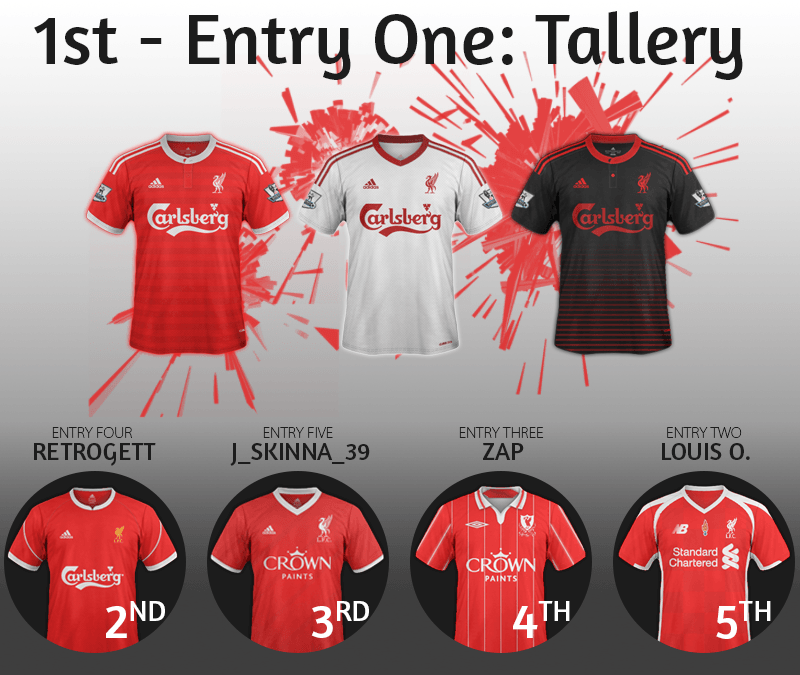 Fourth place goes to Zap, whose retro kits attracted 5 votes out of 42. And last place goes to last week’s winner, Louis O. – whose kits were not the best he could do, and only collected a dire 4 votes. So, Louis O. keeps his place at the top of the leaderboard, despite a poor week, and still sits with 10 points. Tallery (me) has caught up though, reducing the point difference to just one with a win this week. Third place goes to J_Skinna_39, who sits level on points with Zap, but his username gives him that little boost. Zap consequently takes 4th place, and Retrogott sits last place, having only been in the competition for one challenge, and has a respectable 2 points with that second place finish. Well, what another brilliant week of designing, with Liverpool being an attractive challenge for the designers. But unfortunately, its time we move on. Tomorrow (Monday 27th April) the next challenge will be revealed, but it is not I that will be revealing it, unfortunately. My fellow friend AlexTHFC will be taking the duty, due to my rather hectic schedule. I hope the choice proves to be popular, and we get the same amount of entrants and voters for that challenge as we did this. But for now, that’s it from me, see you on reveal day! Congrats to both the #hoster & the #winner of the #competition. It's been a fair contest, see y'all again for next week. Yes, I know, no Watford?! It's a disgrace. Western Sydney Wanderers Football Club (colloquially known as Western Sydney, or simply as Wanderers) is an Australian professional soccer club based in the western region of Sydney, New South Wales. It competes in the country's premier soccer competition, the A-League, under license from Football Federation Australia (FFA). The club has established itself as a major force in both Australia and Asia, having won one A-League Premiership and an AFC Champions League title in its short history. Through its success, the club has been described as "world football's fairytale". Their club colours are red and black. Their original kit, way back in June 2012, featured a red and black hoop jerset, white shorts and black socks. Of course, you only have to do the shirts. The second kit has the same hoop design as the home kit, with red and white instead of red and black. However, the current away kit is grey and white hoops. Ever since they were founded, their kits have been manufactured by Nike, while they've been sponsored by NRMA Insurance, Westfield and Mitsubishi Electric over the years. You can use other colours, and you don't have to use all of these, except for the two main colours. These are just for guidance. Idk Tallery said he wanted to go around the world I think. The due date will still be as scheduled (Wednesday 29th April). PLEASE STILL PM TALLERY WITH YOUR SUBMISSIONS. He is just coincidentally busy on Monday 27th April. He will be able to post the voting. You will need at least a home and away kit, and if you want, you can produce a third kit to accompany it. You are allowed to use a historical or custom-made club logo, and you are also allowed to use a completely different sponsor. Don't show anybody else your kits or it'll ruin the element of surprise to the poll. If you have any questions, PM TALLERY, or DM him on Twitter: @Tallery. I wish you luck! "Reason: Idk Tallery said he wanted to go around the world I think." No need to add anything else, it's funny enough as it is. WEEK THREE IS UP FOR VOTING! PRAISE BE TO THE LORD ALEX! Let's just get the results done with so I can publicly yell at Laura for not setting the timers. Six people entered this week, and only four of them got any votes. Set 4, unfortunately, got 0 votes. These kits were done by RossCoombs! Set 6 also got 0 votes, and were done by yours truly. I would make a speech but tbh no. In fourth place, with 1 vote, is J_Skinna, with Set 3! The kits made by Nike got 6.3% of votes. In third place, with a massive 2 votes, is Set 2, made by Zap! The kits were made by Nike and got 12.5% of the votes. And now... in second place... is InfraRed! She picked up 3 votes (18.8%) with Set 1, made by Nike. RETROGOTT! Retrogott was responsible for making set five, and scored well over half of the votes. His Nike-made kits blew the competition away. Set five deserves to win, great logo placement. Congrats! Burton Albion Football Club is an English football club based in Burton-upon-Trent, Staffordshire. The club participates in Football League Two, the fourth tier in the English football league system. The club's home ground is the Pirelli Stadium, having moved from Eton Park in 2005. The club's nickname is The Brewers, stemming from the town's brewing heritage dating back hundreds of years. The club competed in the non-League of English football from their founding in 1950 until 2009, despite the Football League heritage of their predecessors Burton Swifts, Burton United, and Burton Wanderers. The Brewers finished a respectable 13th in their first campaign in the Football League (2009), and 19th in their second campaign after a season much interrupted by the weather. Following an end of season collapse, Burton fell from 5th place on Boxing Day to 17th place at the end of the 2011–12 season, which included a 17 game winless run and the sacking of Paul Peschisolido. In Gary Rowett's first full season in charge, he led them to 4th and the play-offs, missing out on automatic promotion by two points. Following the fourth place finish, Burton lost their play-off semi-final 4–5 on aggregate to Bradford City despite winning the first leg 3–2 at Valley Parade. 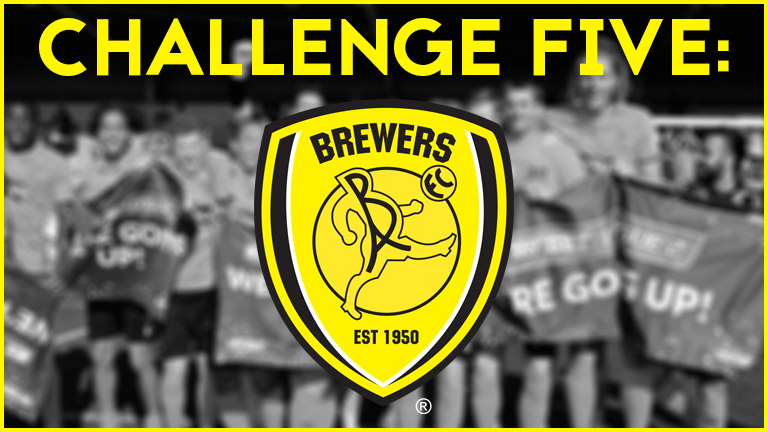 After this season the Brewers came back and, despite finishing 6th in the 2013–14 season, they reached the play-off final but lost a narrow match 1–0 against Fleetwood Town. During the 2014–15 season Rowett left to join Birmingham City, and was replaced by Jimmy Floyd Hasselbaink. On 18 April, Burton won 2–1 away at Morecambe to earn promotion to League One for the first time in their history. Their kits have always been yellow and black since the club’s formation, and more often than not included some form of stripes – whether they are full on stripes or subtle pinstripes. There away kit has been historically white but others colours have featured. As I said before, I want to start a series if you will, promoting the champions, not just of England, but other nations too. Also, many of you who are not from the UK probably won’t of heard of some of these clubs, so it also introduces them too you! The due date will still be as scheduled (Wednesday 6th May). PLEASE PM ME WITH YOUR SUBMISSIONS. You will need at least a home and away kit, and if you want, you can produce a third kit to accompany it. You are allowed to use a historical or custom-made club logo, and you are also allowed to use a completely different sponsor. Don't show anybody else your kits or it'll ruin the element of surprise to the poll. If you have any questions, PM me, or DM me on Twitter: @Tallery. I wish you luck! You are reading "FMScout's Kit of the Week 2015".